This post was written by J.D. DeCastra, a University Programs Student at Auburn University who is focusing in the undergraduate Prevention Track. I recently attended the 2011 Eighth District (Coastal Region) Conference in Fort Walton Beach, Florida. Before I go into detail about my experiences at the conference I would like to give a little background on who I am and the specific part of the Auxiliary that I come from. My name is J.D. DeCastra. I am a twenty year old mechanical engineering student at Auburn University. I joined the Coast Guard Auxiliary at Auburn (Eagle Detachment!) in October 2010. It was in early January when I first heard about the conference, and all I knew was that it was a great opportunity to, meet people, learn more about the auxiliary, and promote the University Program. So, I decided to attend the conference and left early Friday morning. The conference was broken up into three days, the first day, Thursday, was registration, which I had to miss due to a lab. The second day, Friday, started out fast and did not slow down. When I first arrived at the hotel, I was standing there for no more than two minutes before I was lead to a table where Commodore Simpson was eating breakfast and from that point on I was continuously meeting new and important people - Patti Fritchie, and Commander Barner, from Coast Guard Headquarters in Washington, DC, to name a few. Every person that I met was very interested in why I was there and what I was a part of. From my experiences, beginning with the first day, I grew to understand what it meant from the leaders of District Eight Coastal Region to have a young person as a member of their organization, and one of the many values the university program gives to the Auxiliary. Everyone I spoke with was extremely enthusiastic when they spoke to me about the value of the Auxiliary, and seemed excited to hear about our Auburn student’s involvement. The third day, Saturday, was the last day of the conference and three main events were scheduled for the day: an all hands “volunteer power workshop”, a boat ride at Coast Guard Station Destin, and the Awards Banquet. The third day was not only a great day for me personally, but was also beneficial for the Auburn University Program. I walked into the volunteer seminar and took my seat next to my Flotilla Commander, Mr. Shaw, and waited for the seminar to start. Once it began, one of the first things out of the Mr. McKee’s mouth was a question. He wanted everyone under the age of thirty to raise their hand, and mine was the only one to go up. At this point in time I was not aware that the main reason for this seminar was to come up with ideas of how to energize and engage young, junior auxiliarists. After Mr. McKee asked the question, he approached me, introduced himself, and asked me a couple questions. His last question was if he could pick on me and my generation. Not quite sure what he had in mind, I agreed. Several minutes into the seminar Mr. McKee split the room into Generation Y (me) and the people over thirty to discuss the work ethics of the opposing generations. After each side had come up with their opinions, we presented them to the group as a whole. The over thirties went first, and everything they said was true. There were two interesting facts that came out of this. The first was their point of view was different. Since I grew up a member of generation Y, and working mainly with people my own age all I knew was the work ethic of my generation. I have learned how to exploit our positive attributes while coping with the negative, and I never looked at it from an outsiders view until that seminar. The second, and more interesting, is that in their youth they acted the same. Then it was my turn to describe how I saw the work ethic of their generation. I presented my points and backed them up with examples of how my generation was different from the older generations, all while trying not to offend anyone. I spoke for several minutes, and once done, Mr. McKee continued on with the seminar. At the end of the conference the floor was opened for questions. There were several question directed towards Mr. Shaw and I. The next thing we knew the question and answer session turned into a brainstorming session. At the end of the seminar, everyone seemed very pleased with the outcome. Not only did I learn a lot about how to lead volunteers, but Mr. Shaw and I were able to help other flotillas in their mission to obtain a more diverse age group. After the seminar it was time to head over to small boat station Destin to go out on one of the 41 ft. patrol boats. The weather that day was perfect for a boat ride, the seas were flat and the air temperature was in the mid sixties. I was under the impression that we were just going to take a ride on the boats and come back; however, once we arrived at Station Destin, I learned that we were going to watch helicopter training. This made the trip even more exciting since I hope to make flight school and fly helicopters for the Coast Guard. After we arrived at the rendezvous point, we waited for the helicopter to arrive. In about 15 minutes, we saw an H-65 Dolphin over the eastern horizon. The H-65 was approaching fairly quickly and very low. The interesting part was that we could barely hear the H-65 until it was right on top of us. Once the Dolphin approached the boats, it began to hover over the other boat, and descend in altitude until it was only about 50 ft off of the water. The helicopter was tracking the movement of the boats perfectly and the crew of the H-65 began to lower the basket to the 41foot UTB underneath. As the helicopter crew was lowering and raising the basket, the crew on our boat was explaining what was happening, and why certain things were being done. One particular part was the grounding of the basket before it landed on the boat. We watched the helicopter training for a while until we started to head back. As we were leaving the area we passed directly under the rotor wash of the helicopter. The boat ride ended up being a great way to end the conference, and I was glad that I decided to attend. While I was saying good bye to all of the great people that I met everyone seemed disappointed that I was not attending the banquet, and it was a few minutes into my good bye’s when I was approached by District Captain Roy Pell, who invited me to be a guest of honor at his table. I was very honored by this invitation, and was lucky enough to have my suit in my car. It was at this point where I was informed that I would not be dining with the District Captain, but instead I was going to be joining Commodore Simpson and Rear Admiral Landry at the Commodore’s table. I was thrilled and more than a little bit nervous about this change in events. At the start of the banquet everyone walked through the greeting line shaking the hands several important and distinguished people. It was during this point that I was able meet Rear Admiral Landry, and say goodbye to Commander Barner. After the greeting line, I followed Mr. Shaw to the Commodore’s table and I was shown my seat, which was right next to Admiral Landry. Once we finally started eating, all I could think of was; sit up straight, elbows off the table, and use proper etiquette. After the meal was over the closing ceremony began, awards were given to people who had done outstanding things. It was at this point I realized the true magnitude of the people that I had just spent my weekend with. There were a vast number of people who had volunteered thousands of hours of their time to Auxiliary. One of the most memorable awards given was to an Auxiliarist also sitting at the Commodore’s table, Mr. Paul Shurte, who had led his flotilla in doing some great and amazing things. It was at this moment that the conference had the greatest impact my view of the auxiliary, and the relationship that the University Program plays in it. I was in the room with hundreds of people who have sacrificed a great deal of their time to protect the public, and who have done far greater things than me. These amazing people gave me the honor of sitting at the same table with Admiral Landry, and Commodore Simpson, simply because I was a member of generation Y. This demonstrated to me the importance they place on the next generation in the Coast Guard Auxiliary. It is hard to describe in words. 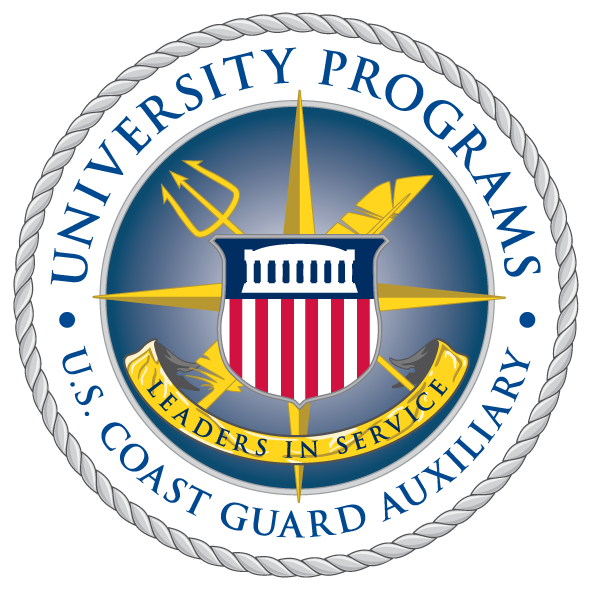 I believe the Coast Guard Auxiliary University Programs can bring an exciting and new dimension to the Auxiliary, and these students can also learn so much from the highly motivated more senior Auxiliarists who give so much, to do even more to the great cause of public boating safety, and saving lives.